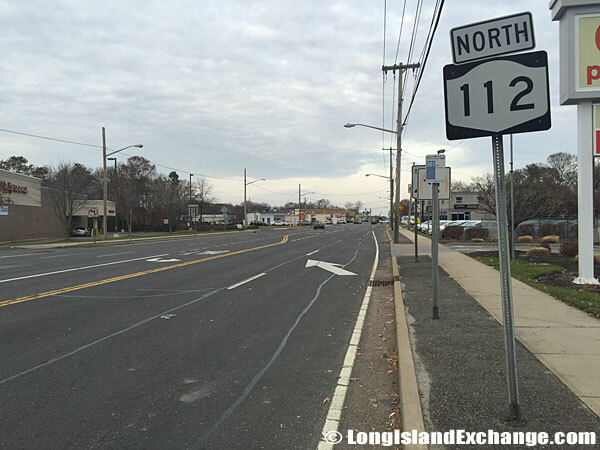 New York State Route 112 has a long and storied history as a part of Long Island. Originally known as Patchogue Stage Road at the end of the nineteenth century and the early twentieth, it served as the main avenue of transportation for those traveling between Patchogue and Port Jefferson. Route 112 heading southbound from Sunrise Highway. Route 112 Northbound at Middle Country Road Intersection, Coram. Route 112 Northbound towards Long Island Expressway, Medford. In the late nineteenth century it especially held cultural significance due to a portion of its road serving as part of the Long Island Bicycle Path. While most of it was acquired by the state over time, there was still a segment maintained by the Patchogue village itself as late as the 1920s. Adding to that, it wasn’t until 1930 that the road was finally renumbered as a state highway to become New York Route 112. The route itself is now located entirely within the town of Brookhaven, which is located in Suffolk County, New York. 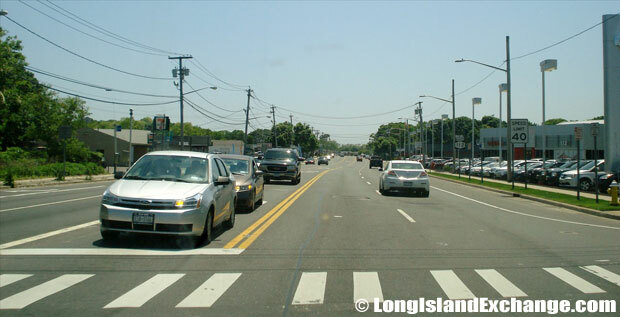 The route changes it names numerous times throughout the areas it travels through, from Medford Avenue, to Patchogue Road, to Port Jefferson-Patchogue Road, though it is also referred to simply as Route 112. Route 112 northbound towards the Long Island Expressway. Route 112 Northbound towards Long Island Avenue, Medford. 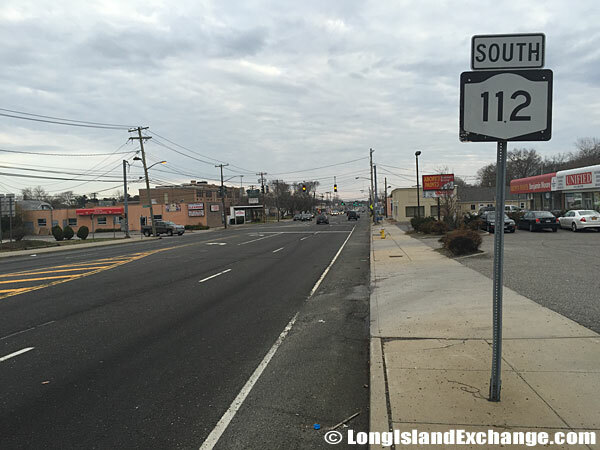 Route 112 Southbound approaching Sunrise Highway, North Patchogue. 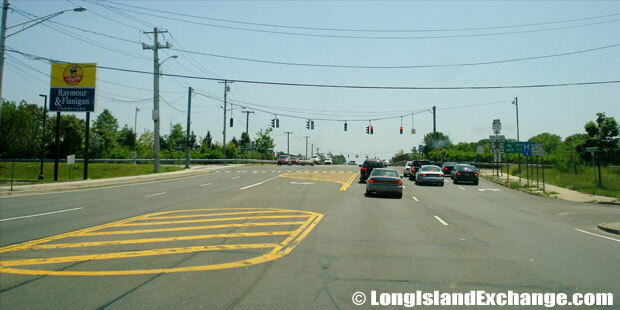 Beginning at an intersection in County Route 80 in Patchogue, the route turns into Medford Avenue and stays within Patchogue until an intersection at Lakewood Avenue, at which point it enters Brookhaven. Here the route doesn’t change, instead offering such sights as the Medford Elementary School as it enters interchange 53 of Sunrise Highway. At an intersection with Shaber Road the route takes on a new name again as Medford Road which it remains as throughout its course in Brookhaven. Tremont Elementary School can be seen as it crosses Greenport Road, at which point the route then moves under the Long Island Rail Road’s Greenport Branch near the Medford station. From here the route goes under the tracks and then enters the Long Island Expressway. After an intersection with Horse Block Road, the route turns into two lanes and passes sights such as the Blue Ridge Golf Club and Holy Sepulchre Cemetery. Finally, it changes it name once again from Medford Avenue back to its more historically accurate name of Port Jefferson-Patchogue Road. 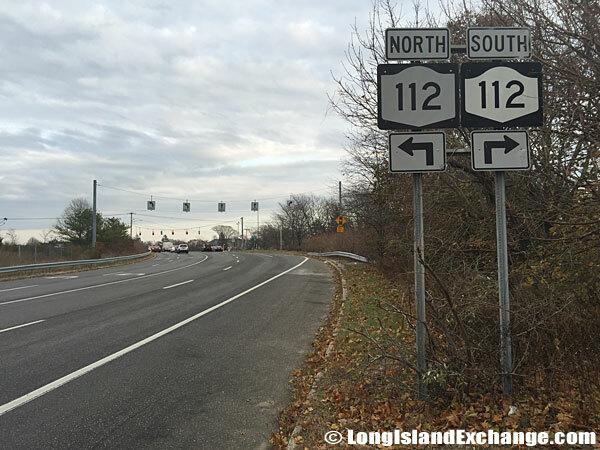 Exiting from Sunrise Highway, these signs alert drivers that Route 112 heads north and south. Route 112 Southbound at Woodside Avenue, North Patchogue. Route 112 Southbound towards East Main Street, Patchogue. 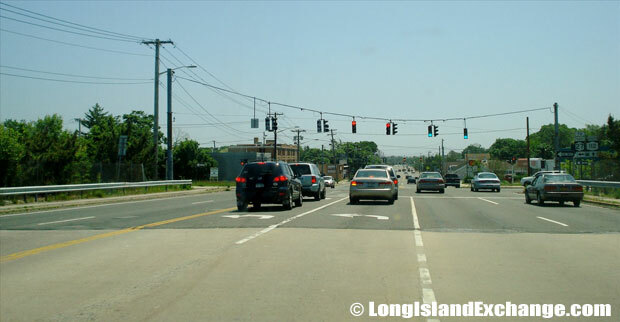 The route itself has gotten attention recently from the New York State Department of Transportation (NYSDOT), as last year the state spent over seventy million dollars on improving its safety and ecological impact. NYSDOT has noted that the road sees as many as thirty thousand motorists per day. In an attempt to encourage pedestrians to use alternate forms of travel, new bike paths have been installed in the route as well as more effective and aesthetically pleasing bus stops. The reconstruction project has helped to revitalize the aging road and turned it into an attractive area for those who might not otherwise notice what its locale has to offer. 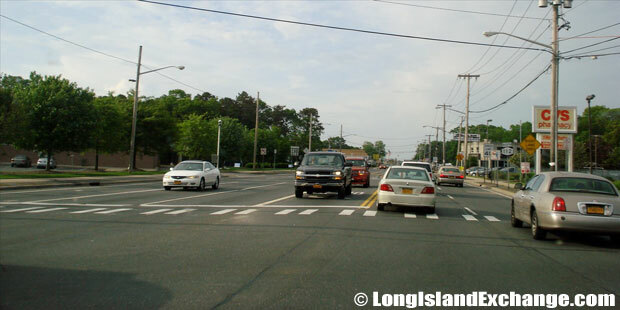 NYSDOT hopes that pedestrians will be more inclined to visit local businesses now that the road is designed to be less congested.